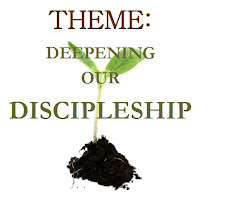 The Catholic Students' Society exists to build a new generation of Catholic health professionals that lead a life of worship, radiate Christ through service, & grow in faith as a family. A very warm greeting to all of you and I wish all of you a bountiful and prosperous year filled with God's blessings and love. Although we might face shortcomings along the way, I hope in times like this, you would continue to pray and strive to overcome whatever obstacles you are facing. "Whatever that doesn't kill you makes you stronger!" So let us all buck up and embrace this New Year with a strong and bold heart. Hi CSS IMU-ers! I know it's been a very long time since anyone last posted anything here. Sorry about that. Anyway, from now on, we shall use this blog as one of our platforms to keep you guys updated! Coming up with our very own club T-shirt and badge! Also, we have an upcoming joint event with the Student Representative Council (SRC) and the other religious clubs in IMU, such as the Muslim Student Society (MSoc), the Buddhist Society, and the Christian Fellowship (CF). 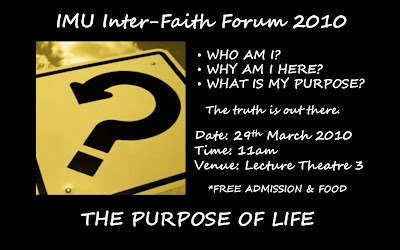 This event is the INTER-FAITH FORUM. 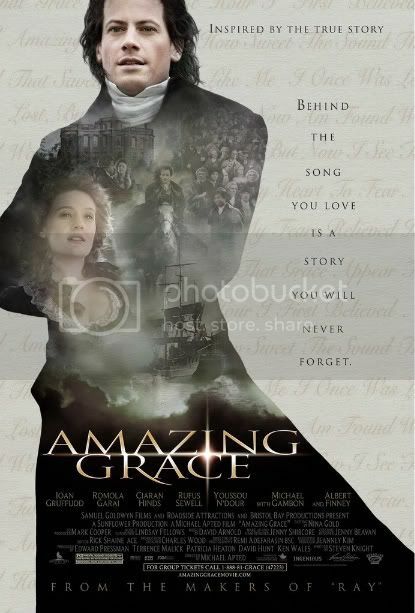 Below is the poster for the event. Will upload the promo ad ASAP. 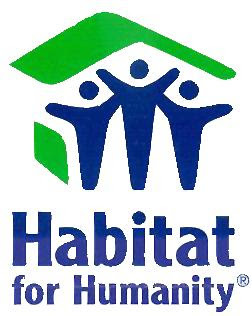 Also, I am proud to announce we are now affiliated with the NGO, Habitat for Humanity. But basically, HFH is a great organization with branches worldwide, which deals with poverty housing. HFH is concerned with creating an awareness that there are indeed people living in such dire situations and then proceeding to give these people a HAND-UP in life and not a HAND-DOWN, (which means HFH encourages the patrons to pay for their own new homes but at a much reduced cost so as to empower them instead having them expect things, i.e "GIVE a man a fish, he will eat for a day, TEACH a man to fish, and he'll eat for a life time"). Among the projects we will do as a club is to help create an awareness for poverty housing amongst IMU students and staff. More information on this project will be posted up soon. Keep an eye out for it! If you have any ideas on this or want to participate, please do email us. The more the merrier! For any further inquiries, do not hesitate to contact us @ css.imu@gmail.com or leave a comment here with your email address and we'll get back to you as soon as possible. 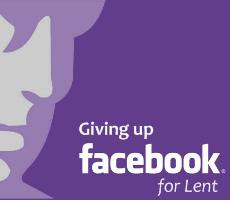 Here's wishing you all a blessed season of Lent! This week is the first sunday of Advent. 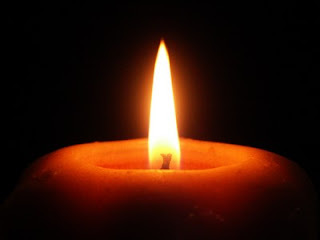 And this week is when we light the first of four candles - the candle of Hope. 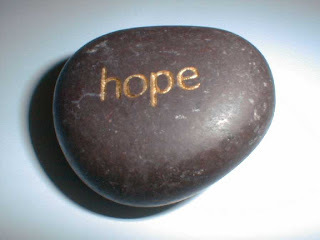 Hope has been a massively marketed concept these days. And yet, sometimes we fail to understand the magnitude of this hope. Being in Malaysia, it's relatively easy to take the world for granted, to always think that the world will catch us when we fall. It is easy for us, as Catholics and Christians, to hold on to our faith, because God seems to have made it good for us. So easy for us to cling on to this image of Christ as a loving Redeemer and Savior. Others have a different story to tell. 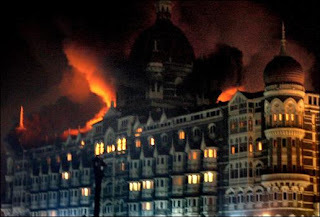 When senseless destruction rocks the world, when people are killed for no apparent reason, when family members are snatched away in one fell moment, well...hope does not come so easy. But there is hope. There will always be hope. 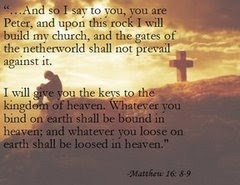 And we as Christians live with this hope in our hearts because of the knowledge that Christ died for us, and He will be coming back to save us all. And until then, He and His Father will watch over us. "For this reason, keep alert and never give up; pray always for all God's people." So as we light the candle of Hope this Sunday, as we journey together into the first Sunday of Advent, let's all try and discover the true meaning of Christmas together. And let's all pray that we will have enough hope to share with all the people of the world that need it more than us. The blog has been dead for some time. But it's back! This week, as the poster says, what is coming to be an anuual event, judging by the past year or so. 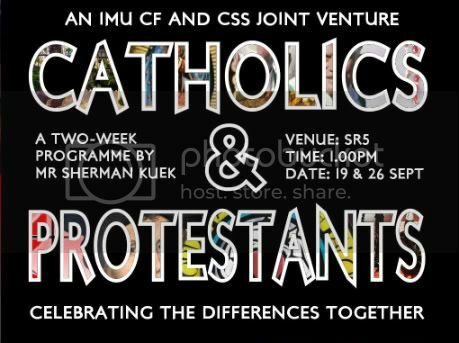 It's the difference between Catholic and Protestant faith. We'll be organizing it with the Christian Fellowship, so note that there's a change in venue. It's now at SR5 (Seminar Room 5) as opposed to the previous SR2. Do come! Let's see what God wants to say to us. Break open the popcorn. And the Bible, of course. *ust who makes these cheesy one-liners anyway? Anyway, come and see. I promise it won't bore the socks off you. If you wore socks, that is. This is good...I'd even go so far to say that it is necessary. Almost the entire Christian faith is based on the Bible. Even sacred tradition is mentioned the Bible, which led to the formation of the Catholic Church and the faith as we know it today. Isn't it scary to think that we know so little of the authenticity of this source, upon which lives are built? P.S. 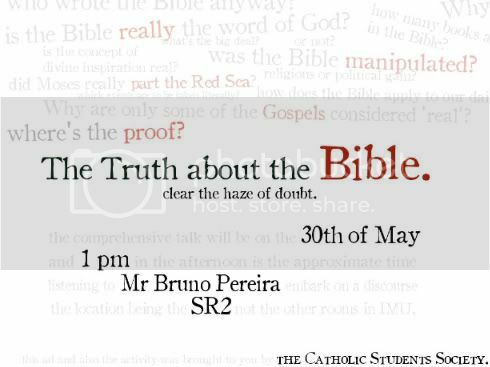 Come with questions - our guest speaker, Mr. Bruno Pereira will be happy to field any you may have. You can even post them on the blog and we'll get back to you. from all the people of the Catholic Students Society. It’s great that you’ve found our official blog. We are the Catholic Students Society of the International Medical University, Bukit Jalil, Malaysia, and the contents of this blog centre around the activities we conduct and the fellowship we share. Transport will be arranged for people who live in the IMU Vista Komenwel hostels and the surrounding areas. We usually attend church at about 6.00 pm on Saturday evening. Please contact us if you nbeed transport - we are only too happy to provide for you.